Clash guitarist Mick Jones says the new 12-disc box set, “Sound System” (due September 9), is the band’s final reissue project. “Sound System” features all of The Clash’s seminal studio albums remastered, 3 CD demos, non-album singles, rarities and B-sides, DVD of all videos with unseen footage by Julien Temple and Don Letts, original and newly commissioned Clash fanzines, exclusive poster, dog tags, stickers, badges and more. 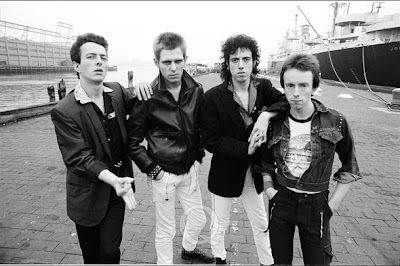 While there was a Clash box set issued about 20 years ago, Jones explains there was a mission for the new project. The 2-CD best-of album, “The Clash Hits Back” replicates the running order of the group’s July 19, 1982 setlist at the Brixton Fair Deal (now the Academy) with studio versions of the songs … plus 8 additional tracks. “The Clash 5 Studio-Album Set” is a separate box set which collect the band's original five studio albums (The Clash, Give 'Em Enough Rope, London Calling, Sandinista! and Combat Rock) into one package.